Security forces also reportedly used flashbang grenades and pepper spray to push protesters back from the parliament building. According to Greek newspaper Kathimerin, the police had been ordered to refrain from using chemicals against protesters. Around 70,000 people, as estimated by Reuters, gathered in front of the parliament for the country’s biggest anti-austerity protest since the new government came to power. "EU, IMF out!" shouted the angry crowd. "For the past two-to-three years we've been living an incredible social catastrophe," one of the protesters told Agence France Presse. "My salary has been cut by 50 percent. I have two children and tomorrow I don't know if I'll have a job." 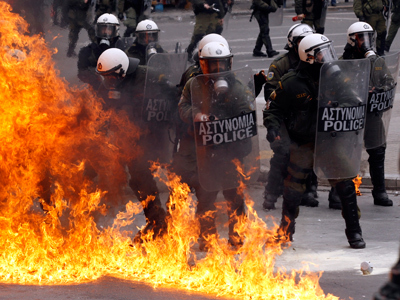 Clashes erupted in different parts of Athens Syntagma Square, with demonstrators throwing fire bombs at police. Witnesses reported smoke rising over the square as security forces dispersed most of the protesters. Some remained, and continued the demonstration; others relocated to the streets of Panepistimiou and Benaki, where again started clashing with riot police. Some 120 arrest were made throughout the capital. Police say protesters smashed bus stop kiosks and set fire to garbage cans. More than 3,000 police officers – double the usual number – were deployed in the capital of Athens to counter the protesters. 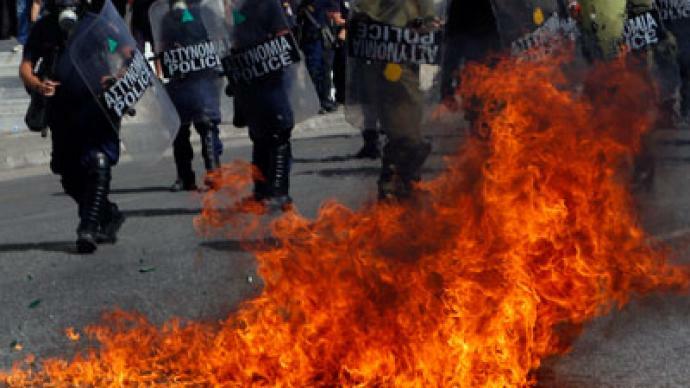 On Wednesday, Greece was gripped by a 24-hour general strike, which halted transit and other industries nationwide. Flights and trains were suspended, shops were shuttered and the hospitals were forced to rely on emergency staffing. The strike was called by the country’s two largest trade unions, representing half of Greece’s workers. As many as 350,000 Greeks poured out into streets across the country to protest austerity, estimates the civil servants union ADEDY. In the second largest city of Thessaloniki, around 18,000 demonstrators rallied. Greeks wrote on Twitter that large numbers of protesters are rallying peacefully in the streets. Earlier demonstrations there saw youths setting fire to debris, burning an EU flag, and then clashing with riot police. 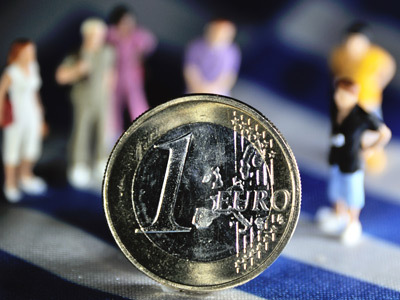 Greece recently enacted a new round of spending cuts, totaling €11.5 billion ($15 billion). The austerity measures are a precondition for another rescue loan from the European Central Bank; without the bailout, Greece could face bankruptcy in a matter of weeks. 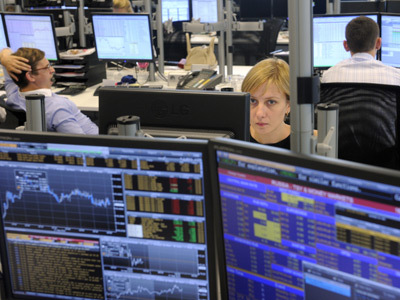 "The new measures are unbearable, unfair and only worsen the crisis. We are determined to fight until we win," Costas Tsikrikas, head of the ADEDY public sector union told Reuters. "We call on all workers to join us in the march against the policies that the troika is imposing." Greece is currently grappling with record unemployment levels, with over 30 percent of the country living below the poverty line. 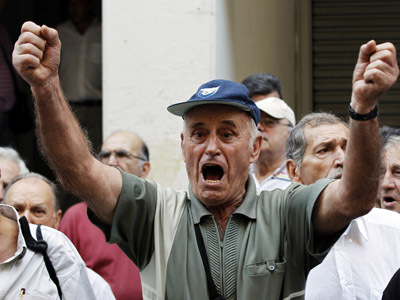 The Greek government is planning to reduce pensions and increase the retirement age to 67 to cope with the country’s budget crisis. Dimitri Kofinas, an RT producer at Capital Account, in Washington told RT that he doubts whether the best efforts of the EU’s leaders to save Greece with bailouts will come to anything, “We’re past the point where policy makers in Europe can effectively deal with the situation, but taking that aside anywhere else this would just be too much and I think the markets are going to take over and they are already doing that in the bond market,” he said. Two weeks ago, anger over Greece’s new austerity measures spilled into the streets, with thousands protesting the drastic proposed budget cuts. Last February, the country witnessed days of violent clashes in several cities, with police using tear gas and protesters throwing petrol bombs and stones.